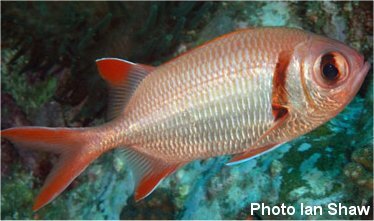 The Kuntee Squirrelfish has large eyes, rough scales and a forked caudal fin. It is red to orange-red above and shades to silver ventrally. There is a blackish bar through the pupil and a broad bar behind the head from the upper end of the gill opening to the pectoral fin base. Squirrel fish inhabit caves and crevices in coral reefs. They are mainly active at night and are carnivorous. Squirrelfish are the night owls of the coral reef. Their notably big eyes, large mouths, and stout fin spines quickly catch the eye where their coloring might lead to them being overlooked as an addition to the marine aquarium. These fish prefer to be up and about at night, hiding in nooks and crevices within the reef during the daylight hours. This species occurs in tropical waters of the Indo-Pacific. In Australia it is known from the central coast of Western Australia, around the tropical north and south on the east coast to northern New South Wales. These are very popular aquarium fishes, and are often caught live for the marine ornamental fish trade.